I say thoughts in this case because I haven't practiced enough to make this process an exact science. While I've found numerous methods are reasonably effective some tip offs remain that irritate me. 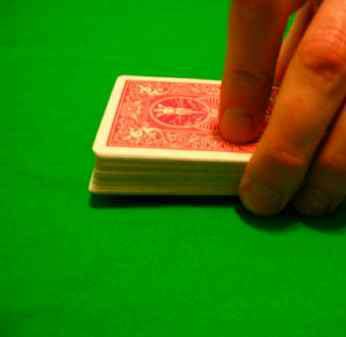 Thus, what I now describe are some ideas I developed based on the concept of dealing from a tabled deck, though they originate for me with me I have no doubt the same notions exist elsewhere since as I see it there aren't a multitude of potential variations to tabled dealing. We shall begin by examining the basic deal and ways in which one might set up the deck for subterfuge at a later date. Although I examined a number of slight variations, I'll focus simply on the one I feel works best for false dealing. 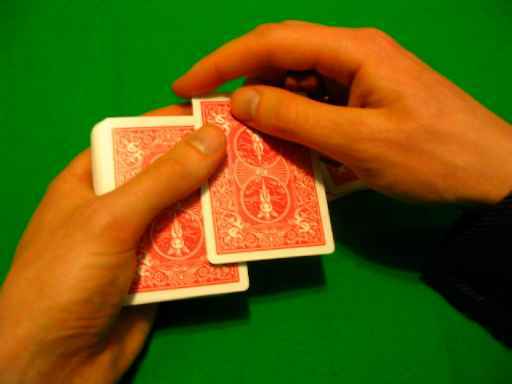 The idea here is to deal quickly, but to cover the top of the deck for a fraction of a second as you perform the take, obstructing any view of the top of the deck so as to facilitate false deals. You should also note that the thumb slides across the top card until it reaches roughly the border at which point it performs the take itself. 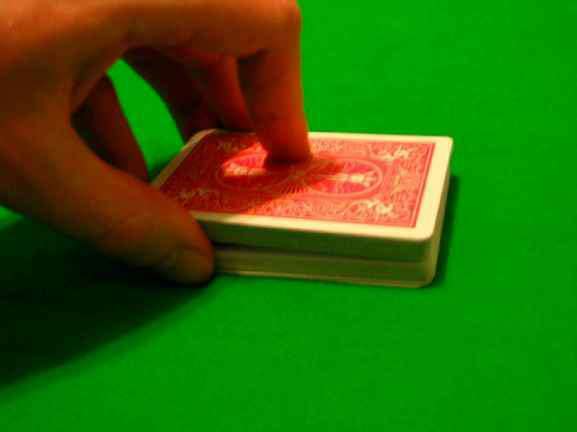 Finally, when you perform the take you should pull the card downward slightly below the level of the top of the deck. 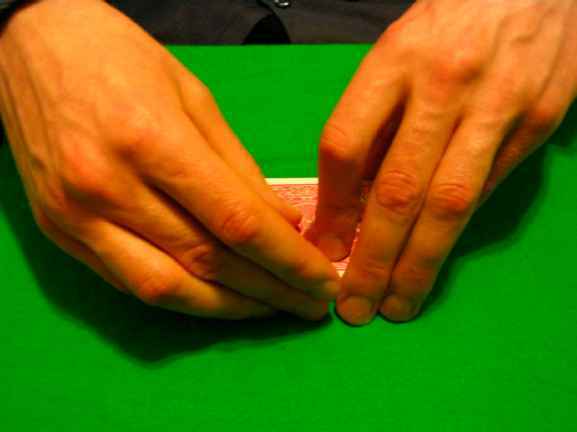 It is important that you perform this action quickly, you want to perform the take so that the card comes out of the deck level (otherwise it will lift the edge of the top card and provide a flash) and then move down to establish consistency with later deals. 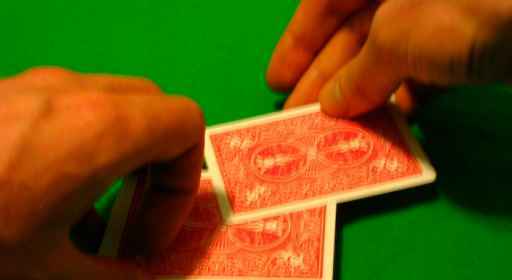 Though I've never really tried it to any great extent, you may find strike doubles are possible, by taking the top two cards rather than just the second card, using the method for tabled seconds. 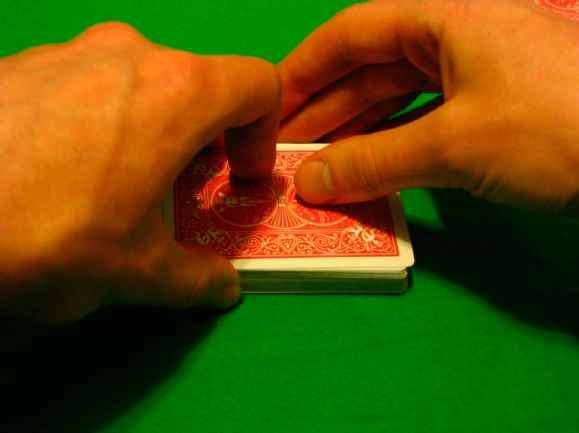 The key now, is simply to perform the take with the last three fingers of your right hand instead of with the thumb, taking the bottom card instead of the top. 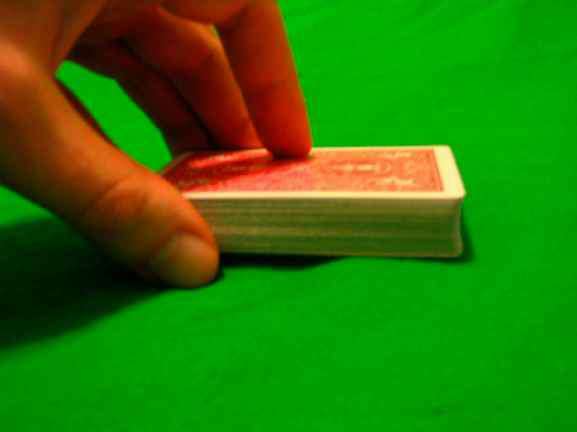 Naturally, you close up the gap under the deck immediately after you've begun performing the take so that it is never exposed to a view from the front. 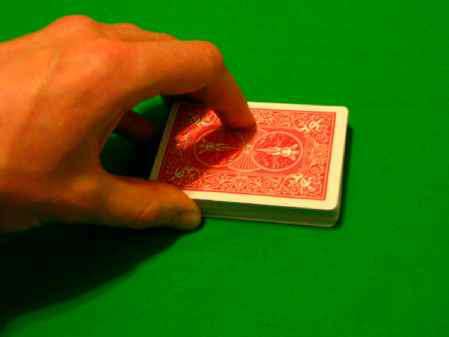 With the card jogged in this manner you will find you are able to perform a take on the card second from bottom, though it is a delicate process and will likely require substantial practice. 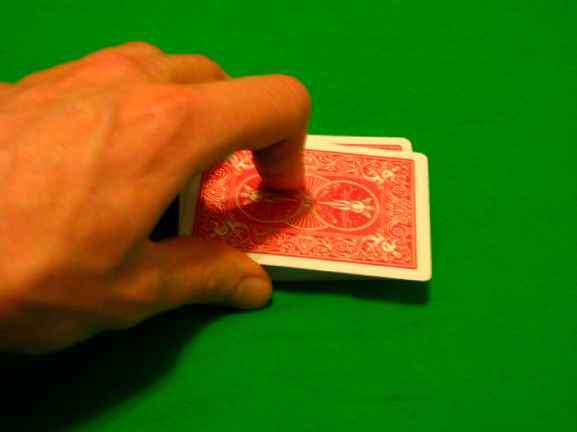 In addition to this, there is naturally the problematic jogged card as a tip off, however, if one employs the correct angles the jog is invisible and thus acceptable. 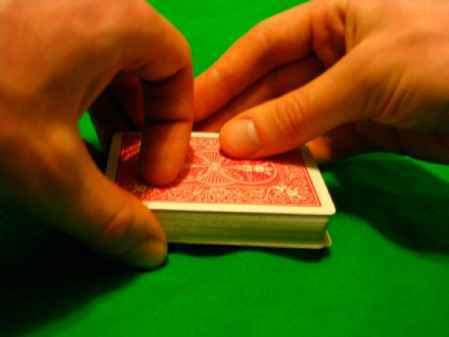 From this point you simply execute the mechanics of the tabled bottom deal in the middle of the deck rather than the bottom. 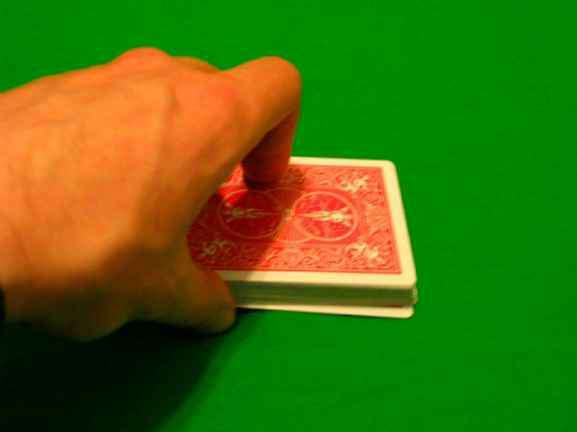 You may find, if you are able, that a slight pivot of the top half of the deck helps as well. 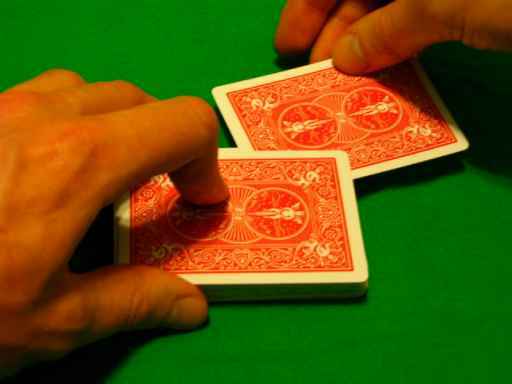 Though it is quite obvious, I figured I would point out that a tabled punch deal is possible using the tabled second deal and feeling for the desired cards with the forefinger if the punch work is on the appropriate portion of the card. 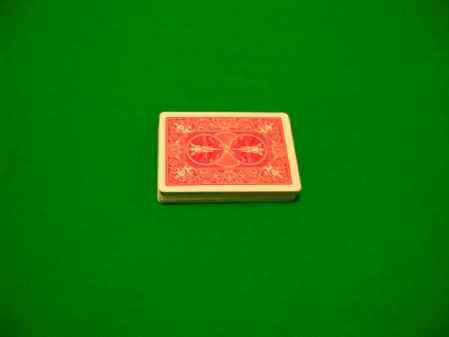 The center of the card works well here, though it is not the only option.